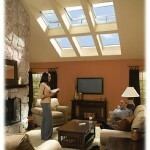 Skylights are used for overhead, out-of-reach applications or with in-reach applications where egress is not required. 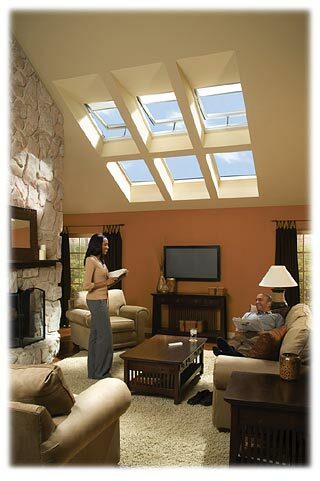 Velux residential skylights offer the complete system for bringing daylight into virtually every space in your home. With their custom designed flashing system, they are virtually leakproof. Velux’ insulated low-E glazing protects interiors by reflecting the vast majority of the sun’s fade-causing rays. 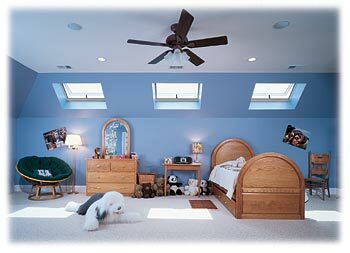 They are also Energy Star rated in every region of the country. Installations where ventilation is not desired, but where a view to the outside would still be beneficial. Electric: Overhead installations that need natural ventilation, especially kitchens and baths. Solor Powered: Overhead installations that need natural ventilation, especially kitchens and baths. 30% Federal Tax Credit Available. Manual: In-reach or overhead installations, not requiring egress, where natural ventilation and manual operation is desired. For new skylight installations, we recommend a deck mounted skylight, which provides a built-in wood frame and protective cladding that mounts directly to the roof. Deck mounted skylights can be used on roofs with pitches of 15 – 85 degrees. The deck mounted model has the most weather tight installation method and provides the most choices in blinds and shades.